This is the first one I actually got to park in my garage. I must say, it looked beautiful in there. I'm not ashamed to admit that after the kids went to bed, I grabbed a folding chair and went out there for some quiet reflection. The Wife may have even discovered me fondling it in a slightly inappropriate manner. I'm very fortunate to have one of the world's best Ferrari mechanics in my backyard - Carlo at Alfa of Tacoma. Seriously. 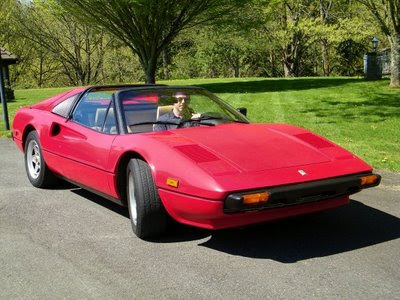 People from all over the US buy Ferraris and ship them to Carlo to get his blessing. He doesn't pull punches. If he says it's a dog, it's a dog. If he says it's a gem, you should do whatever you can to buy it. Unfortunately, he said it was a dog. Specifically, he said the engine would need to be rebuilt. It failed compression testing and leakdown. The brakes were dangerous. The frame was bent from being put on a lift improperly. The timing belt was falling off. The report went on for 4 pages. It was a disaster. So once again, I'm back to being Ferrari-less. I'd like to leave you with a philosophical comment or some great life lesson that I learned here, but I'm just bummed. I never would have pegged you for a 308 kinda' guy. A. Your now screwed as the wife knows the low point bid, and she can set a lower bar now. B. Use the Pregnancy rules. Do not tell us about wonderful cars until your SURE the seed has taken. This is two miscarriages. Next time I want to hear AFTER you get it approved. :). Hopefully the next time will take. 'The Wife' pwned you on this one. She set the price point well. Thanks KenP. The link to the toy Ferraris was great, but since they are listed in British Pounds, I'm not sure I can afford them. As for The Monk Who Sold His Ferrari, I can guarantee one thing. I won't read it. I'm afraid it might inspire me to give up the dream and go do something noble. My brother, this one was just not meant to be. However, I believe with all my heart and soul that you and a Ferrari ARE meant to be. You can't want something so badly for your entire life and have it not happen eventually. Yes you can not have it happen eventually - like when your wife still doesn't have a job. Next time at the Wynn, take down the 100/200 NLHE game for six figures.